OxiGreen in Southampton, PA is proud to be a locally owned, highly experienced, affordable carpet cleaning company. Having served the community for more than 25 years, we understand the importance of money saving, yet high quality carpet cleaning. Using our state of the art, truck mounted carpet cleaning machines, we provide a long lasting, deep carpet cleaning. No superficial job here! Just with normal, daily life, dirt, bacteria, dust mites, and other pollutants become trapped deep in the fibers of your carpet, and they go completely undisturbed by the average vacuum and carpet cleaner. OxiGreen in Southampton, PA uses 100% green cleaning agents to do the job, which are environmentally friendly and non-toxic for you family. Our process reaches deep into the fibers of your carpet to extract the dirt and potential allergens that detract for the air quality in your home and can have harmful effects of the members of your family. Not only will we improve the appearance of your carpet, we will improve the indoor health of your home. All of the carpet cleaning technicians at OxiGreen are certified by the IICRC, the Institute of Inspection, Cleaning and Restoration Certification. The IICRC is independent organization that trains and monitors carpet cleaning technicians throughout the Unites States. We also offer a 100% satisfaction guarantee. If you are not completely satisfied, or if stains reappear in you carpets within 30 day of our service, we will take care of it for free. 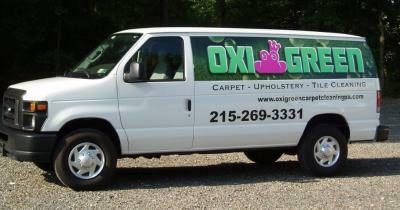 For affordable, high quality carpet cleaning, call OxiGreen in Southampton, PA today at 215-269-3331. Our friendly customer service reps are available to answer your questions and schedule a free, in home carpet inspection. You may also visit our website to learn more about our company, find out about our other interior home cleaning services, such as tile and grout cleanings, and read customer reviews.